48 Urban Garden, housed in the Ileana Tounta Contemporary Art Center, has a sleek and sophisticated atmosphere. At Numismatic Museum Café, visitors may enjoy a cup of traditional Greek coffee amid replicas of ancient Greek sculptures. Black Duck Garden, which offers light lunches and desserts alongside coffee, was once part of King Otto’s royal garden. Six D.o.g.s is a contemporary, chilled-out paradise serving blended coffee drinks and snacks, with plenty of outlets to charge your laptop. “Drink coffee, be cool” reads a spirited street art mural in the centre of Athens. It’s no secret Greeks love their coffee; a glass of strong freddo (iced) espresso is all the boost most locals need to start a hot summer day. And when temperatures really rise, coffee aficionados pass on conventional coffee shops in favour of the city’s lovely “garden cafés”—lush courtyard oases shaded from the scorching sun. From the historically iconic to the hippest in town, these are the most serene spots in Athens to sip your brew. 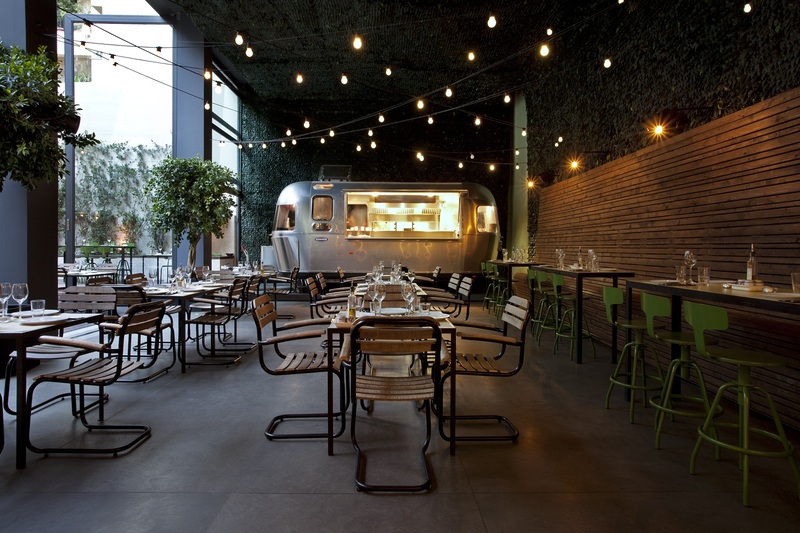 Housed in the Ileana Tounta Contemporary Art Center, 48 Urban Garden is no ordinary café. Yellow tables and green stools next to an oversized wooden bench immediately set the surreal, artistic tone. Its trademark vintage trailer is the inspiration behind the delicious street food options as well as the herb-infused cocktails and coffee drinks on the menu. 48’s urban aesthetic blends with the surrounding flowers and pots of fresh vegetables and fruits, making this the ultimate “urban garden.” The (artificial) ivy covering the walls and ceiling adds an extra green touch to the café’s look. 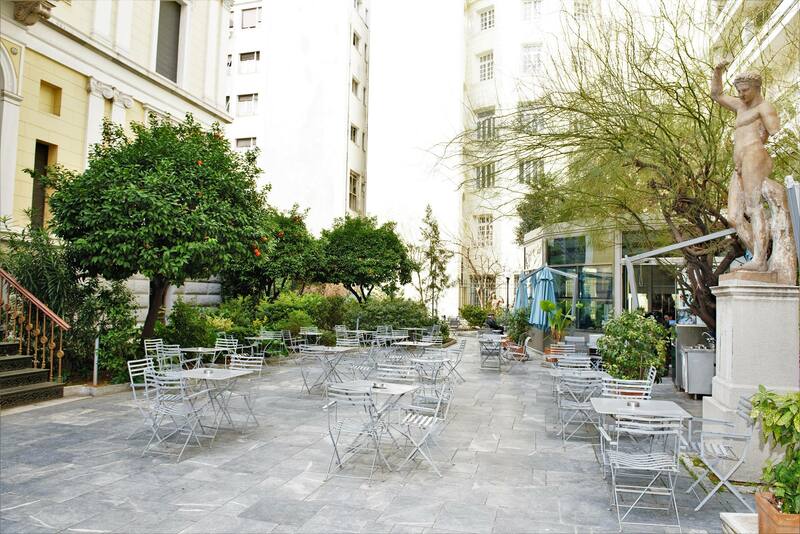 48 Armatolon & Klefton St.
One of the most elegant cafés in the city can be found in the courtyard of the Numismatic Museum of Athens, which documents Greece’s history of coinage from its sixth century BC roots to the present day. Known as “Iliou Melathron” (Palace of Troy), the property that houses the museum—designed by architect Ernst Ziller in 1880—was once the residence of renowned archaeologist Heinrich Schliemann. 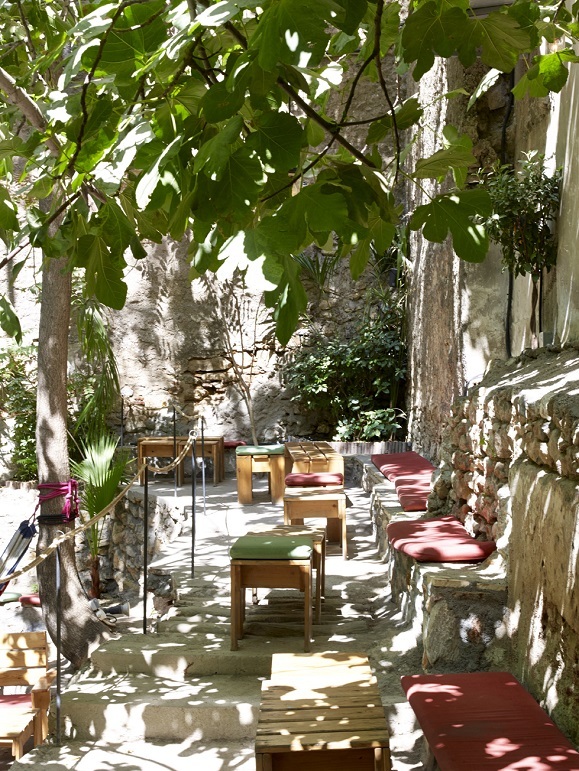 Behind its heavy steel gate lies a serene sanctuary with rich vegetation where today visitors may enjoy a cup of traditional Greek coffee amid replicas of ancient Greek sculptures and mature orange trees. 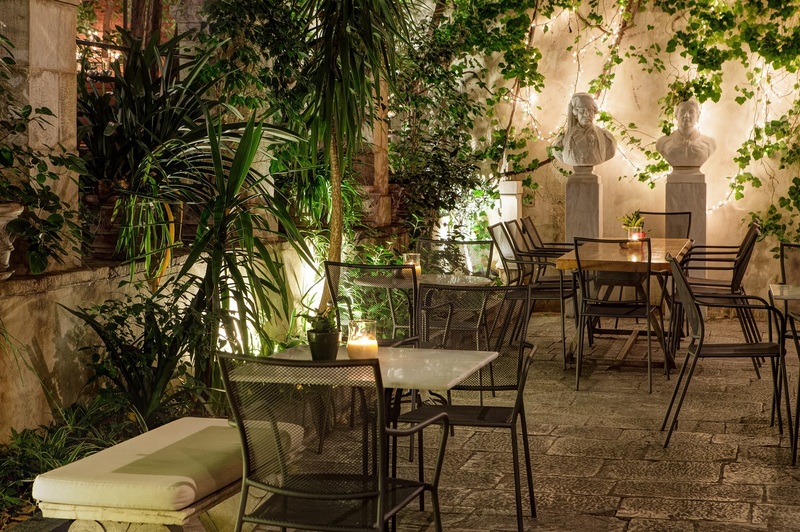 Located near the Athens city centre, this romantic bistro has the atmosphere of a secret hideout. Black Duck Garden, which offers light lunches and desserts alongside coffee inside an imperial-looking garden with leafy trees and marble tables, is indeed royal—it was part of King Otto’s palace garden between 1836 and 1843. The palm tree planted by his wife Amalia of Oldenburg still stands, while the couple’s former residence has been turned into a museum next to the café. In a more alternative setting near the Monastiraki flea market, the bohemian haven of Six D.o.g.s serves all kinds of cold coffee blends, milkshakes, and smoothies, along with bagels and hot dogs to snack on. The café straddles different levels, and its wooden tables sit on river sand. Combining a beachy, relaxed atmosphere with a youthful, tech-friendly vibe (you’ll find outlets to charge your phone and laptop around the trees), Six D.o.g.s is a contemporary, chilled-out paradise.